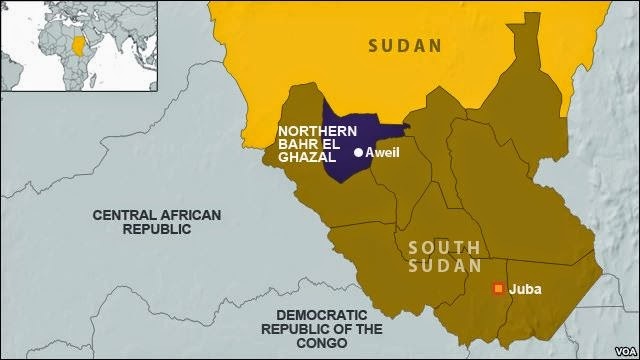 At least 29 people have been killed in clashes between pro- and anti-government forces in Northern Bahr el Ghazal in South Sudan, shattering the fragile peace in a state that has been largely unaffected by seven months of fighting in the country, officials said Wednesday. Aweil West County Commissioner Garang Kuach Ariath said all of the dead were on the opposition side. Two were officers and the rest were soldiers, he said. Four government soldiers were wounded in the fighting, which started Monday and lasted nearly 24 hours, Ariath said. Defense Minister Kuol Manyang Juuk blamed soldiers who deserted two weeks ago from the SPLA’s Fifth Division in neighboring Western Bahr al Ghazal state for the unrest. “They have just been roaming around, trying to go to Sudan from the northwestern part of South Sudan," he said. "They attacked the population with the intention of getting food," he said. Manyang and army spokesman Philip Aguer said government forces are pursuing the rebels as they head toward Sudan. Santino Mayuat Ngong who represents Aweil Centre County in the state legislature, said the deserters also looted a medical clinic in the area last week, killing one person and taking two others hostage. "They looted 5,000 South Sudanese Pounds, captured two and killed one person," he said. SPLM-in-Opposition military spokesman Lul Ruai Koang said he has not received any reports of fighting in Northern Bahr al Ghazal state, and expressed doubt that opposition forces were responsible for looting the clinic or for the alleged abductions. "Looting and abducting people is not part of our culture," he said. "If there were any abductions, then this must be Arab nomads, the Misseriya and the rest who normally come to Northern Aweil. We do not have this culture of abducting people. Abducting them and taking them where?" he said. Looting has been widely documented during the seven-month conflict, particularly in states that have been hard hit by the conflict. Abductions are not unheard of either, and have in the past been blamed on now disbanded rebel groups, the Lord's Resistance Army, and cattle raiders.